(CNN) -- The president she once pointed a gun at has been dead for nearly three years, and her longtime idol and leader, Charles Manson, remains in prison. 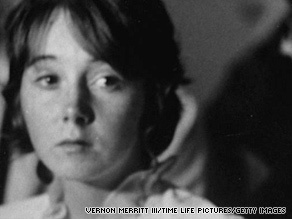 Lynnette "Squeaky" Fromme appears in court in Los Angeles, California, in December 1969. However, Lynette "Squeaky" Fromme is about to get her first taste of real freedom in more than three decades. According to the Federal Bureau of Prisons, Fromme, now 60, is set to be released on parole August 16. Fromme is housed at Federal Medical Center Carswell in Fort Worth, Texas. For years, she was one of Manson's few remaining followers, as many other "Manson Family" members have shunned him. A prison spokeswoman would not say whether Fromme continues to correspond with Manson. Fromme was convicted in 1975 of pointing a gun at then-President Gerald Ford in Sacramento, California. Secret Service agents prevented her from firing, but the gun was later found to have no bullet in the chamber, although it contained a clip of ammunition. In a 1987 interview with CNN affiliate WCHS, Fromme, then housed in West Virginia, recalled the president "had his hands out and was waving ... and he looked like cardboard to me. But at the same time, I had ejected the bullet in my apartment and I used the gun as it was." She said it never occurred to her that she could wind up in prison. Asked whether she had any regrets, Fromme said, "No. No, I don't. I feel it was fate." However, she said she thought that her incarceration was "unnecessary" and that she couldn't see herself repeating her offense. "My argument to the jury was, if she wanted to kill him, she would have shot him," John Virga, a Sacramento attorney appointed to defend Fromme, told CNN on Tuesday. "She'd been around guns. And let's be realistic: We know the Manson family, at least some of them, are killers." Fromme was sentenced to life in prison, but parole was an option at the time, although the federal system later abolished it, said Felicia Ponce, spokeswoman for the Bureau of Prisons. Inmates do receive "good time" -- for every year and one day they serve, Ponce said, 54 days are lopped off their sentence. Fromme became eligible for parole in 1985, Ponce said. According to reports, she for years waived her right to a parole hearing. The Bureau of Prisons would not say whether she changed her mind and requested a hearing, but the U.S. Parole Commission's Web site says that everyone who wishes to be considered for parole, except those committed under juvenile delinquency procedures, must complete a parole application. Federal inmates serving life are generally paroled after 30 years, unless the parole commission decides to block the release, according to a commission spokesman. Inmates who are paroled remain under supervision until the commission decides to terminate the sentence. Fromme was not granted parole until July 2008, Ponce said. She was not released then, however, because of extra time added to her sentence for a 1987 escape from the West Virginia prison, which occurred after her interview that same year. She was found two days later, only a few miles from the prison. At the time, prison officials said they were looking into rumors that Fromme escaped after hearing Manson was ill, according to news reports. FMC-Carswell spokeswoman Maria Douglas would not comment on Fromme's behavior in prison in recent years. Fromme reportedly joined Manson's family after meeting him in California in 1967. She was not involved in the murders of seven people, including pregnant actress Sharon Tate, on August 9 and 10, 1969, that landed Manson and other followers in prison. However, she and other Manson followers maintained a vigil outside the courthouse during his trial. In the WCHS interview, Fromme said that Manson should not be incarcerated because "he didn't kill anybody. ... I would rather be in, because I know I laid a lot of my thinking in his mind." Virga said he told the jury that Fromme assaulted Ford, but did not attempt to assassinate him. If Fromme had killed the president, no one would have listened to her, he said. "She didn't want people to think she was a kook." And she wasn't, he said, recalling that Fromme was very cooperative during her trial and describing her as "a bright, intelligent young woman" from a middle-class family. "It's just hard to imagine how she got all caught up with Manson," he said. Fromme wanted to be heard on issues including the environment, he said. "She had certain causes that she wanted to talk about. But first and foremost in her mind was always Manson." Explaining herself after the attempt, according to the book "Real Life at the White House," Fromme said, "Well, you know, when people treat you like a child and pay no attention to the things you say, you have to do something." During her trial, Virga traveled to Washington to depose Ford, who testified on videotape about the incident. In the 1978 interview, Fromme called Manson "a once-in-a-lifetime soul. ... He's got more heart and spirit than anyone I've ever met." She said she still corresponded with him. "He's got everything he wants coming from me, 'cause he gave me everything." She said then she didn't plan to seek a parole hearing: "The parole board does not hold my life in its hands. And I don't want to be too critical, but men tend to think they do. Charlie never thought he did. He never expressed all this desire for power, this desire for acceptance." Ford died in 2006 at age 93. The Gerald R. Ford Presidential Foundation did not respond to CNN requests for comment on Fromme's release. Virga, who is still practicing in Sacramento, said he had not heard from Fromme since her sentencing in 1975. "I wish her the best, and hope everything works out for her, and hope she stays out of trouble," he said. "She needs to stay out of trouble. She's been in prison a long time ... it was, in my mind, a tragedy that she wound up a disciple of Manson."